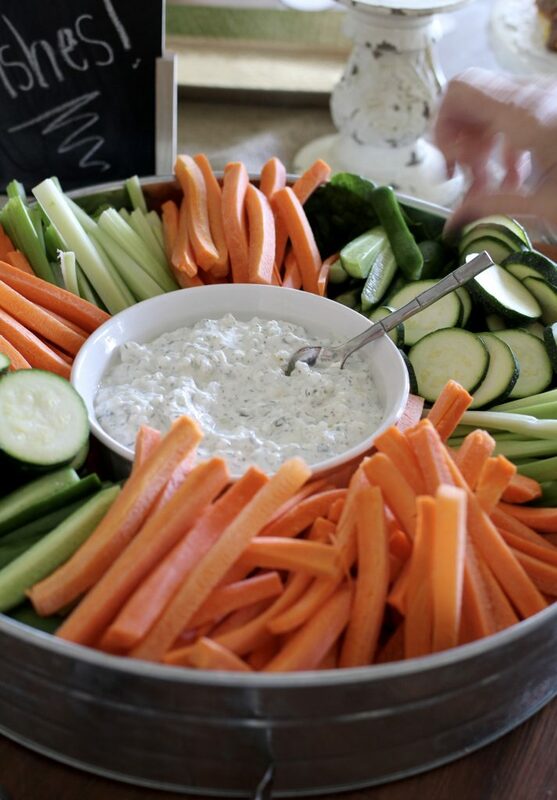 Dip doesn’t have to be full of fat to be full of flavor! 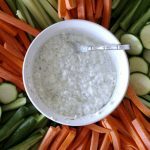 Five Minute Cottage Cheese Dill Dip is made with greek yogurt, cottage cheese and a few dried herbs and spices you probably have in your pantry. 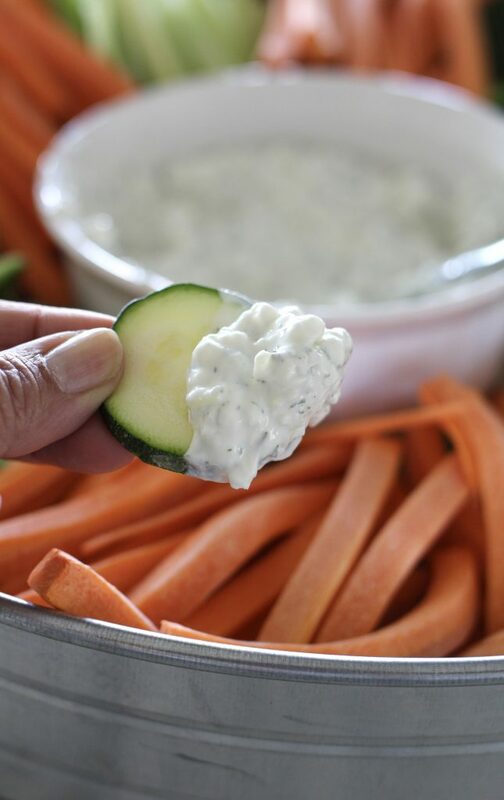 It can be made in five minutes and is our favorite protein packed dip to accompany veggies or crackers. My sister in law, Diane has been making this dip for years and bringing it to family events. 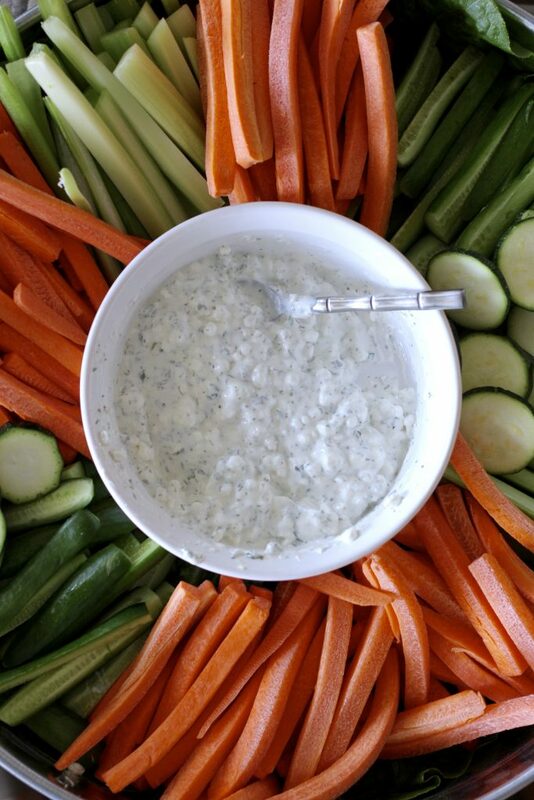 I’ve seen variations for Cottage Cheese Dill Dip that range from blending cottage cheese to make a smooth dip, to using fresh herbs instead of dried, and all types of dairy options (sour cream, yogurt, cream cheese). 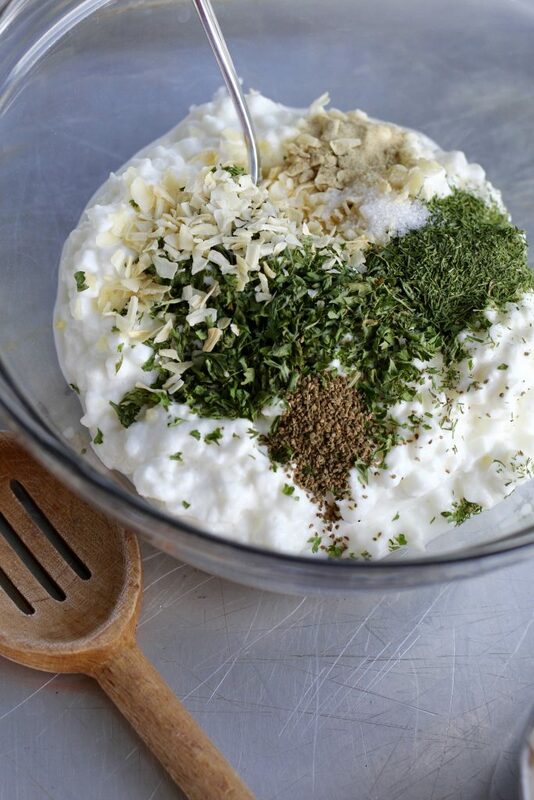 Diane’s original recipe calls for using cottage cheese, mayo and sour cream, along with dried herbs. I lighten it up a bit by using Greek yogurt and low fat cottage cheese.You can alter the basic ingredients in Five Minute Dill Dip to suit your taste and desired amount of calories 🙂 I’m typically a flavor first, instead of a calorie-counter type of person, unless there’s not much of a difference in flavor, then I’ll substitute the lower calorie option. I love dishes that taste great and come together in a few minutes. 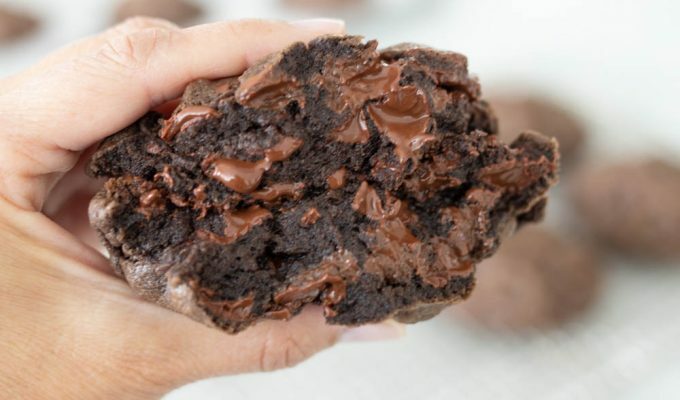 This recipe is perfect for days when you don’t have a lot of spare time but still want homemade! If you serve this with pita wedges or a sliced baguette along with cut up veggies, it’s a very filling appetizer. Make sure to take a look at the notes on the recipe for suggestions and substitutions. One of the important ingredients in this recipe is Beau Monde seasoning. You can order this online, it is difficult to find at grocery stores. Or you can simply make your own at home! I;ve made it both ways using Beau Monde seasoning and making my own. Personally, I like the home made option a little better. Beau Monde seasoning is a combination of salt, celery seed an onion powder. And a couple of preservatives to prevent caking. That’s it. Most of us have salt, celery seed and onion salt or powder in our pantry. Either way, make sure to include these essential ingredients when making Five Minute Dill Dip. Hope you’ve all had a memorable summer and are ready for some FALL COOKING! Place all ingredients in a bowl and mix with large spoon. Serve with veggies, baguette slices or cut up pita wedges. -you may use a combination of the following:2 cups cottage cheese, 1/2 cup mayo, 1/2 cup sour cream1 cup cottage cheese, 1 cup sour cream, 1/2 cup mayo1 cup cottage cheese, 1 8 oz block cream cheese regular or low fat- you may use fresh parsley, about 1/4 cup chopped fine, 2 tablespoons fresh chopped dill, 1/4 cup minced fresh onion white or green-Make sure to mix the cottage cheese and yogurt before using, liquid often rises to the top, making the top of the container much more wet than the bottom. -This dip is best when made at least 6 hours prior to serving and left in the refrigerator to allow flavors to develop and the dip to thicken. -If you would rather serve the dip smooth, place the ingredients into a blender and blend before adding the herbs and spices. You may also use an immersion blender. Dilly dip is one of my childhood memories. This was a staple always with cut up veggies. Thanks for sharing a healthier version. I would love to know what some of the other goodies are on that beautifully set table? Love your recipes and website! Hi Si – This is a great dip to add to my repertoire, thanks! My need to know question is about your ‘What’s Up Doc’ carrot sticks. Carrot sticks cut like this actually taste so much better, not to mention how perfect they look. If you use a tool other than a knife, could you share with me what you use to get them precise and uniform? A knife just doesn’t ‘cut it’ for me! Haha! PS – I love your new profile photo :-).